Health Care Polls: Opinion Gap or Information Gap? [When] I look at the polls, most of the concerns are pretty reasonable. People aren’t responding to “lies”. They are saying that they do not believe administration claims that this program will reduce the budget deficit without impacting quality of care–a pretty safe bet, to my mind. But even if you disagree, it is not crazy and delusional to believe that government programs often do not deliver what the politicians who enacted them promised. It’s a pretty safe reading of history, actually. With due respect to Megan, however, the debate over health care is not playing out like the one in elite circles of public opinion, in which Ezra Klein and I represent the pro-bill coalition and she and David Brooks the opposition. As this month’s tracking survey from the Kaiser Family Foundation makes clear, there are a lot of beliefs the public has about the bill which are objectively wrong. The following table combines two sets of questions from the Kaiser survey, each of which ask people about the individual components of the bill. One set of questions asks people whether they believe that the bill contains each provision; the other set, which I’ve tabulated on a net basis, asks them whether they’d be more or less likely to support a bill if it contained such a provision. How would public opinion change if people were fully informed about the content of the bills? 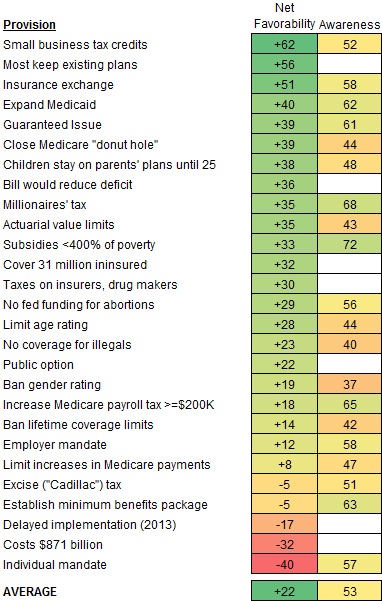 It’s hard to say for sure, but on average, the individual components of the bill are favored by a net of +22 points. An NBC poll in August also found that support went from a -6 net to a +10 when people were actually provided with a description of the bill. Obviously, it’s not as though this is going to do much to help the bill’s popularity in the immediate term. But in the long term, once people actually see the go bill into effect, their perceptions are liable to improve, in ways that might help the Democratic party. Although there are a few things like the individual mandate which the public obviously does not like, most of the other components of the bill are things they are liable to be quite pleased with and to find quite reasonable. Lastly, it’s much harder to read the opinion polls as a “mandate” against the health care bill when much of that opinion is based on demonstrably false beliefs, some of which have been perpetuated deliberately by opponents. And it’s much harder to know how the Democrats ever expect to pass a health care bill or similarly complicated policies like cap-and-trade if they wither in the face of polls that reflect less a disparity of opinion and more a poverty of accurate information.